Sorry this unexpected Road Trip of Death stopped me from getting the next installment of our current Sam and Fuzzy done in time for today's update! In lieu of that, please enjoy this never-before-seen-online Skull Panda strip. It's a short excerpt from the epic, multi-part exclusive story found in Rikk's first book, Skull Panda In Love. 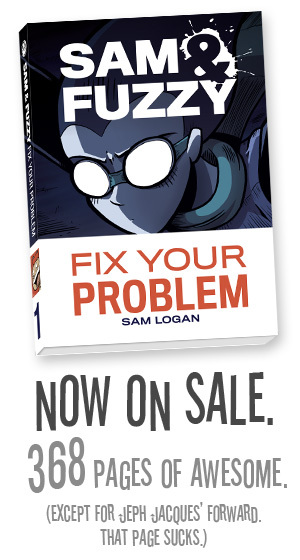 (Which, along with our new Sam and Fuzzy book, is on sale now in our Topatoco store!) I hope you enjoy it. We return on Friday, back to business as usual! Thanks for your patience, team.